As the race for the school board seat in L.A. Unified’s Board District 5 officially heads to a runoff, Jackie Goldberg has yet to break a sweat. With ardent backing from the teachers union, the 74-year-old former school board member nabbed 15,935 votes — 48.18 percent of the 33,074 total primary ballots cast — in the March 5 primary’s tally that the county certified Friday. Her runoff opponent, district parent and former L.A. city official Heather Repenning, clocked in far behind, with about 13 percent of the vote. Even before Friday’s certification, Goldberg told LA School Report that she and her team were already prepping for a runoff, and sticking to the strategy and priorities that got her to where she is now. A prominent face of union support and charter school skepticism during January’s teacher strike, Goldberg had mounted a primary campaign that nearly secured her the more than 50 percent majority vote required to win outright amid a pool of 10 candidates. Goldberg added on Monday that her campaign has “picked up additional endorsements, and people are calling up to say, ‘How can I help?’ So we’re off and running.” Goldberg tweeted Tuesday that she had picked up the endorsement of Latino primary candidate Cynthia González, whom the Los Angeles Times had endorsed. United Teachers Los Angeles has spent about $670,000 to support her election so far. 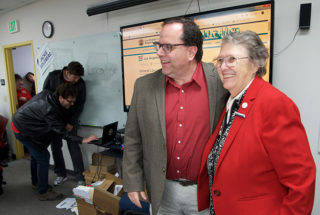 If elected in the May 14 runoff, Goldberg — who would swing the board toward a more union-friendly agenda — would be seated as soon as the county certifies the results, which is tentatively slated for May 24, according to the county. The seat has been vacant since Ref Rodríguez, an education reformer and charter school founder, resigned in July after pleading guilty to political money laundering charges. The term runs through December 2020, though Goldberg told LA School Report in February that she could try to stay past then. Up until Wednesday, there was a possibility that Huntington Park Councilwoman Graciela Ortíz, who Repenning narrowly beat by 31 votes for a spot in the runoff against Goldberg, would request a recount. Ortíz opted against a recount on Wednesday. (1/2) Title I — and public education, in general — has been chronically underfunded. Goldberg said that in all of her past positions, she’s never represented the southeast part of Board District 5, known as BD5. The southeast is the poorer section BD5. Student enrollment is almost entirely Latino, and all seven of the state’s lowest-performing schools that are in BD5 are located there. It includes the cities of Huntington Park, Maywood, South Gate and Bell. Goldberg lives in Silver Lake, which is in the northern, more affluent part of BD5. Other northern cities in the board district are Highland Park, Echo Park, Eagle Rock and Los Feliz. *This article has been updated to include Cynthia González’s endorsement of Goldberg and Ortiz’s decision on Wednesday to not request a recount.